Launched by the Office of the Provost in 2013, the Innovation Institute is the University’s hub for activities that promote and foster innovation and entrepreneurship on campus and throughout the Pittsburgh region. The Institute is built on a foundation supported by education, collaboration, communication, and economic development. The goals of the Institute are to encourage and support innovation and entrepreneurship on campus and in the community, and to foster a culture of innovation and entrepreneurship at Pitt among faculty, staff and students. The Institute for Entrepreneurial Excellence, which provides entrepreneurial education, networking, and assistance for local entrepreneurs and small businesses. The Coulter Translational Research Partners II Program at the University of Pittsburgh is led and administered by the Swanson School of Engineering’s Department of Bioengineering in partnership with the McGowan Institute for Regenerative Medicine, University of Pittsburgh School of Medicine and the Offices of Technology Management and Enterprise Development. It’s mission is to identify, select, develop, and commercialize promising projects undertaken together by bioengineers and clinical faculty that address unmet clinical needs and better patient care worldwide. We will achieve this mission by either facilitating the licensing of these technologies or by enabling the formation of start-up ventures that obtain follow-on institutional funding. Bioengineering research at the University of Pittsburgh incorporates the application of engineering and biologic principles, methods, and technology in two broad areas: scientific inquires into fundamental biological phenomena; development of instrumentation, materials, devices, and systems relative to application in the biological sciences and medicine. Active, externally funded areas of research include: computer processing of biologically derived signals; computer analysis of radiographic, ultrasonic, and nuclear magnetic resonance images; development of prostheses, artificial organs, and implantable sensors; development of medically related instrumentation; mathematical modeling of physiological systems; tissue engineering; environmental control technology using biological and physical chemical techniques; biomaterials and biocompatibility; musculoskeletal biomechanics and sports medicine; cardiovascular biomechanics; and, rehabilitation biomechanics. The Department has recently undertaken a major organizational thrust in Translational Research. Translational Research at Pittsburgh aims to improve patient care and accelerate the delivery of healthcare technology from academia to the patient via a Bedside to Bench to Business to Bedside (B4) paradigm. The Center for Military Medicine Research (CMMR), Health Sciences, is focused on applications of regenerative medicine, reconstructive medicine, transplantation immunology and neuroscience, including traumatic brain injury and neuroprosthetics, with the aim of getting innovative therapies to wounded warriors. CMMR represents a formal mechanism through which the challenges and opportunities of casualty care and wound healing can be examined at an advanced research level. It enables a network of successful partnerships and collaborations between scientists, clinicians, industry and the U.S. departments of Defense and Veterans Affairs to foster the most promising research technologies and therapeutic strategies. To learn more please visit www.cmmr.pitt.edu. 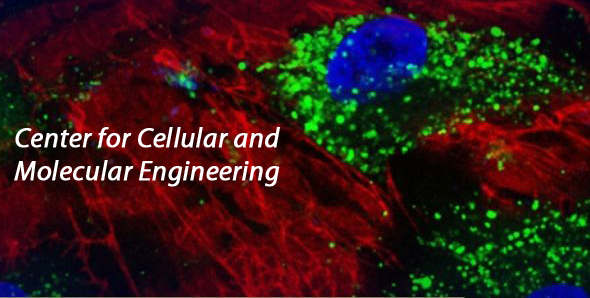 The mission of the Center for Cellular and Molecular Engineering (CCME) is to apply the principles of cellular and molecular science and engineering to restore tissue and organ functions. Special emphasis is placed on building strong basic science foundations for the treatment of injuries and disease of the musculoskeletal system, and utilizing nanotechnology and mechanobiological principles in combination with bioreactor and biomaterials technologies, including 3-dimensional printing, for functional skeletal tissue engineering and regeneration. The Director of CCME, Dr. Rocky S. Tuan is an established leader in musculoskeletal research, including cartilage development, repair, cell signaling, and matrix biochemistry, and a major contributor to stem cell biology and tissue engineering.The Center for Cellular and Molecular Engineering’s mission is to apply the principles of cellular and molecular science and engineering to restore tissue and organ functions. Special emphasis will be placed on building strong basic science foundations for the treatment of injuries and disease of the musculoskeletal system, and utilizing nanotechnology and mechanobiological principles in combination with bioreactor technology for functional skeletal tissue engineering and regeneration. Dr. Tuan has been a leader in musculoskeletal research, including cartilage development, repair, cell signaling, and matrix biochemistry, and a major contributor to stem cell biology and tissue engineering. To learn more please visit www.ccme.pitt.edu. The Louis J. Fox Center for Vision Restoration (Fox Center) of UPMC and the University of Pittsburgh is the first national, comprehensive, multi-disciplinary research and clinical program dedicated to ocular regenerative medicine. The Fox Center focuses on the restoration of sight through tissue regeneration, transplantation and technology. We optimize quality of life for those challenged by vision loss. They insure that individuals and their loved ones know they are not alone in addressing this challenge. The Center seeks to maximize participation in work, community, and society of those who lose their sight for any reason. Finally, They educate the sighted community on the prevalence of vision loss in America and around the world. The UPMC Center for Innovation in Restorative Medicine is a nationally recognized center for excellence in regenerative medicine. As a comprehensive system of access, referral, evaluation, treatment, and long-term care, our center enables patients to explore and access the most promising potential treatments for severe, complex, or challenging injuries, especially where conventional options have been exhausted. The Center offers an array of clinical trials that are on the forefront of regenerative medicine and technology. The Center for Craniofacial Regeneration was established to develop tissue engineering-based treatments for wounds and defects of the face and skull in order to restore function as well as appearance. The tissues of the face and skull are many and complex. Accordingly, the Center’s team represents many disciplines and is rooted in the many achievements made by University of Pittsburgh researchers in tissue regeneration and biomaterial development. The mission of the Clinical and Translational Science Institute (CTSI) at the University of Pittsburgh is to improve the efficiency with which biomedical advances translate to improvements in the health of the community. CTSI is transforming the process of clinical and translational research through the provision of research and educational resources, thus training and enabling scientists to generate and translate new biomedical knowledge. CTSI helps researchers to conduct visionary and relevant clinical and translational research and to move actionable research findings into practice and prevention settings. CTSI offers assistance and services to researchers in all stages of the research spectrum, ranging from basic biomedical investigations to outcomes and community based research. The Joseph M. Katz Graduate School of Business and College of Business Administration leverages the opportunities created by our urban location and strong research culture to prepare students to be catalysts for change. Our mission is to merge communities of knowledge with communities of practice to create exceptional experience-based learning outcomes for students and relevant insights for business leaders. Through Pitt, students and faculty have opportunities to an abundance of cross-disciplinary collaboration. Additionally, at every stage, Katz students serve on cross-functional teams and complete group projects. We’re molding a new breed of leader: The open-minded contributor who is ready for any challenge.